I came across this Kevin Durant shoe that seems to scream cultural appropriation to me. Thanks to the sportingnews.com for the image of Nike Kevin Durant shoe. The shoe raises money for Nike, Kevin Durant and some Native American athletic programs (I assume in that order). But the description is a toxic collection of generalizations and stereotypes mashed together. The bold Nike N7 KD VI features the repeating pattern of arrows that first launched on the Pendleton Woolen Mills Nike N7 blanket last month. The arrow print symbolizes energy and forward motion and has reflective built in for a surprise effect when worn in the elements. The bold colors used on the KD VI have significant meaning in Native communities. Turquoise is used often as a color symbolic of friendship, and red is one of four colors—yellow, red, black and white—featured on the traditional Native America medicine wheel, representing movement and the four directions. The KD logo appears on the heel and the N7 logo is on the tongue. 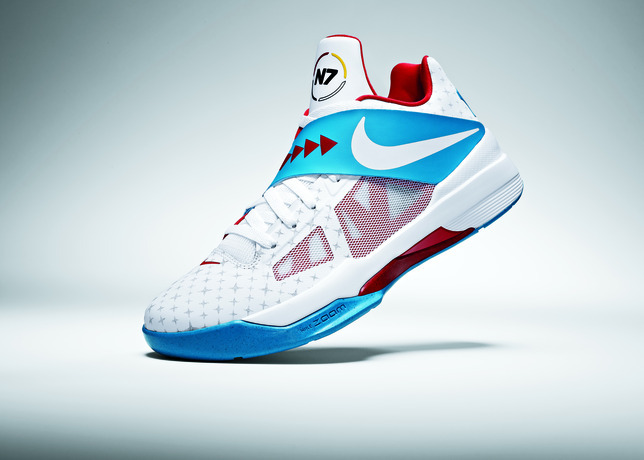 via NIKE, Inc. – Nike N7 and Kevin Durant Collaborate to Support Native American Youth. That is amazing! Red is a color significant for Native Americans! Whoa! It is good to know where that stuff comes from (sarcasm). How about vague ambiguity when it comes to so-called native symbols and precise articulation of the Kevin Durant logo? Nike has also developed a wide shoe, the Air Native N7, for Native North American’s supposedly wider feet (they measured 224 indians feet to justify this claim!) While criticizing the marketing of this shoe, we can lay some of the News from Indian Country analysis against this Kevin Durant shoe press release. via Does the Shoe Fit? Native Nike footwear raises concerns – Indian Country News. I happen to agree that the dual marketing benefit of being seen as charitable to anonymous poor indians helps to sell the shoe as does the appropriation of cultural symbols. I think the same might be said about this Kevin Durant shoe.